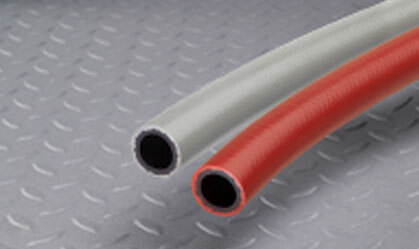 Braid-LockT has a Nitrile rubber tube which provides RMA Class A oil resistance. The hose is also non-conductive and is made with a synthetic rubber cover which provides oil, flame (MSHA approved) and abrasion resistance. Available in ID sizes 1/4" on 600' reels, 3/8" and 1/2" on 400' reels, 5/8" and 3/4" on 150' reels with a choice of new grey or red cover colors, or standard blue and black cover colors. Click here for more info.